Gooding & Company's Monterey cover car glided onto the auction block Sunday night, its brushed aluminum roof a gleaming contrast to the deep black body panels and red undercarriage. 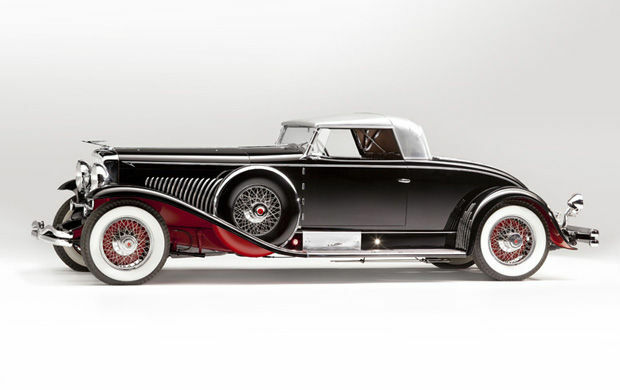 Auctioneer Charlie Ross opened bidding for the Whittell Coupe -- a 1931 Duesenberg Model J Long Wheelbase car -- at $3m, and the price raced in $500k increments to $6m. Ross then patiently coaxed the dollars along, ultimately hammering the car sold at $9.4m. That price ($10.34m with buyer's premium) was a spectacular climax to a stunning weekend of car auction results in Monterey.